El Calafate is the gateway to the Glaciers field of Patagonia. Located 2700km from Buenos Aires, 300km from Rio Gallegos and just about 80km from the Perito Moreno Glacier, the city lies on the shores of Lake Argentino, the largest in Argentina and third in South America. El Calafate, officially founded in 1927, was a stop on the way of many locals from the Andes to the coast. Suddenly, it began to welcome many others on their way to the Perito Moreno Glacier and started to be the base from where to leave to the 80km route, “adventure” at that time. The name came from the local bush “calafate” which fruit is used to make a delicious jam. Once a place characterized for its sheep breading Estancias, it is now a tourist village with many accommodation and dining facilities to offer which preserves the Andean Patagonia atmosphere through its decoration and food. Despite of being located in the southern Patagonia, El Calafate enjoys of a better weather compared to surrounding steppe areas because of the moderating actions of Lake Argentino and for being protected by hills. Temperatures fall below zero during the night in fall and winter, windy days are common during the summer. Dry cold is the way we may define its weather due to the lack of rain, the humidity increases as you get closer to the Perito Moreno Glacier and others glaciers’ area, where you may find frequent drizzles during the fall and winter. El Calafate can be visited all year round. There are no limitations during winter apart from the fewer amount of bus departures to El Chalten, and excursions can be done everyday. From October to March the area can be a bit crowded. If you really want to enjoy El Calafate and the Glaciares National Park, we suggest you stay at least three nights so you can take the two main excursions to Perito Moreno and Upsala Glaciers, they leave early in the morning and return to the hotel in the evening. Staying just two nights will allow you to just visit the Perito Moreno Glacier, which is recommendable for those in a lack of time. El Calafate can be accessed by air from Buenos Aires (3h) and Ushuaia (1h) everyday all year round, and from Bariloche (2h), and Puerto Madryn (1.4h) according to the airline schedules in high season. By bus, you can reach the city from El Chalten (5h), Rio Gallegos (3 to 4h), Ushuaia (12h) and Puerto Natales (7h). early morning departure to the southern arm of Lake Argentino to Los Glaciares National Park. After skirting the Rico Arm of the Lake, you will get to the paths and lookout points of Perito Moreno Glacier, located 85 km from El Calafate.Late afternoon return to El Calafate. The excursion begins in the pier located in Bajo de las Sombras Bay, 6 km from the glacier walls, where you take the 20-minute navigation across the Rico Arm, enjoying breathtaking views of the glacier’s front walls and Icebergs Channel. You disembark on the opposite shore, where specialized mountain guides welcome and lead you to a small hut from where groups of 20 people are assigned a guide who takes them along the lake’s shore towards the edge of the glacier and gives an introductory talk about the geological formation of the area. Once on the ice the guides put each person a pair of crampons on, and explain how to use them. The two hours circuit that follows introduces you to the fascinating landscape of the glaciers: streams, small lagoons, gullies, crevasses and plenty of ice formations of the most incredible blue tons. The trekking is moderate. The ice surface over which you walk is irregular, but firm and safe. 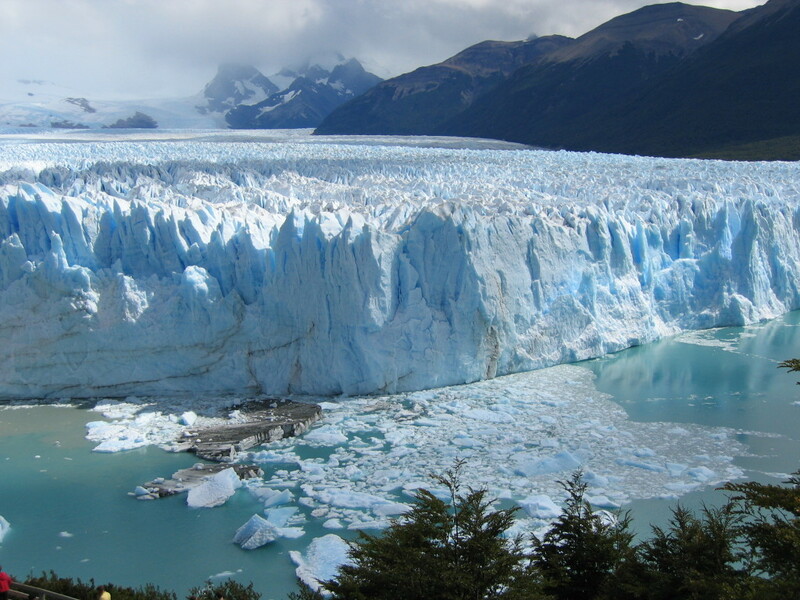 You will receive explanations about flora, fauna and general glaciology of the region and also about the particular phenomenon that happens in the Perito Moreno Glacier and eventually produces its rupture. After the walk, a stroll through the forest brings you back to the shelter. Before heading to El Calafate, you will be taken to a visit to the paths in front of the glacier. a) Footwear: Sport shoes or trekking boots, with warm woolen or cotton socks. Rubber and après ski boots, as well as high heel shoes are not advisable. b) Outfit: Comfortable sports wear, long trousers, warm sweater or pile, water or windproof jacket, sun glasses, sun block, gloves. c) Lunch: Passengers must bring their lunch boxes.